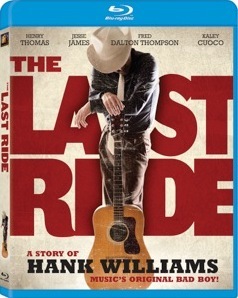 The Last Ride, a movie depicting the final days of Hank Williams, will be released on DVD and Blu-ray on June 6th through Twentieth Century Fox Home Entertainment, but you can win a copy right here on Saving Country Music by leaving the name of your favorite Hank Williams song in the comments section below. Starring Henry Thomas (the kid from ET), Kaley Cuoco (Big Bang Theory), Jesse James, Fred Dalton Thompson, and Fred Tolobowsky, The Last Ride follows the last 72 hours of Hank’s life as he rode in the back his 1951 powder blue Cadillac convertible. It is the powerful tale of country music’s original bad boy. The man, the myth and the music come together when Williams travels from Alabama to a series of New Year’s shows in West Virginia and Ohio. This remarkable journey leads straight into the heart and soul of the legendary performer…as he takes one last shot at redemption. Fans of Hank Williams have waited patiently for news of when the movie would be available to the public since 2011 when information about the film first began to surface. Last year the movie saw a limited theatrical release in 15 select cities, but the new Blu-ray/DVD release will be the first time the film is made available to everyone. The soundtrack for the movie featuring 22 Hank songs sung by various artists was released on June 19th, 2012. Saving Country Music will give away two exclusive copies of the movie to randomly selected readers who leave a comment below with their favorite Hank Williams song. And if you can’t list just one, list as many as you want! Make sure you sign in to the comments section with your REAL email address so we can contact you if you’re the winner! (6-3-2012) – Congratulations to Adam Hook and Doombuggy, both of which were randomly-selected to receive copies of The Last Ride. Thanks to everyone who participated, and keep an eye out for a review of the movie coming soon from Saving Country Music! This movie is going to be so sick! Gotta go with “I Saw the Light” – have a soft spot for Gospel. Lost Highway and Long Gone Lonesome Blues! Cold Cold Heart. Gets me every time! “I Can’t Help It (If I’m Still In Love With You)”. I particularly like the short version that’s available on video where he sings this song with Anita Carter – wonderful stuff!! I don’t have a favorite, but if I had too choose one, Hey Good Lookin’ would have my vote. Some honorable mentions would be Move It On Over, Kaw-Liga; Cold Cold Heart, Howlin’ at the Moon; Your Cheatin’ Heart, Settin’ the Woods on Fire; (The) Lost Highway. Hank it by Justin Moore! Just kidding, Jambalaya. Settin’ the Woods on Fire! I must say though Kaw-Liga holds a very special place. I admire metaphors that are equally brilliant and so easy to understand that they need no explanation. The best example ever of the consequences of not overcoming social phobias. Also, I like songs that shine a light on a perceived love without actually knowing the one you love, such as The Beautiful Waitress by Terry Allen. Weary Blues! Love that song! My Sweet Love Ain’t Around. Nothing comes close to that song for me.
. . . pretty much ANYTHING he wrote. Got to be “I Saw The Light” and “I Can’t Help It If I’m Still In Love With You”. Also love Cold Cold Heart, The Lost Highway, I’m So Lonesome I Could Cry, Your Cheatin Heart, Please Don’t Let Me Love You, The Lovesick Blues, Lonesome Whistle, Crazy Heart, Moanin The Blues, Take These Chains (From My Heart), Mansion On The Hill, Someday You’ll Call My Name, Blue Eyes Cryin In The Rain, Sundown and Sorrow, and OH SO MANY MORE! My all time favorite is Lost Highway but every single song is golden. I’m lucky that I live in Hank’s hometown of Montgomery, Alabama. My favorite song of his is “Move It On Over” which was his first big hit. Too many to pick just one, but after much thought, I’ll have to put “Lost Highway” down here. Even though Leon Payne wrote it, that song IS Hank Williams. My Son Calls Another Man Daddy. The pain in the lyrics are what makes it my favorite. My favorite is My Son Calls Another Man Daddy. So much pain in the lyrics. Tennessee Border if I had to pick only one. My favourites would have to be “Six More Miles (To the Graveyard)”, and “My Main Trial is Yet to Come”. Ramblin’ Man, but also Lost Highway. What ever happened to your article listing several country musicians that could make an impact on mainstream country? Gotta go with Angel of Death, though if ignoring Luke the Drifter il go Move it on Over.